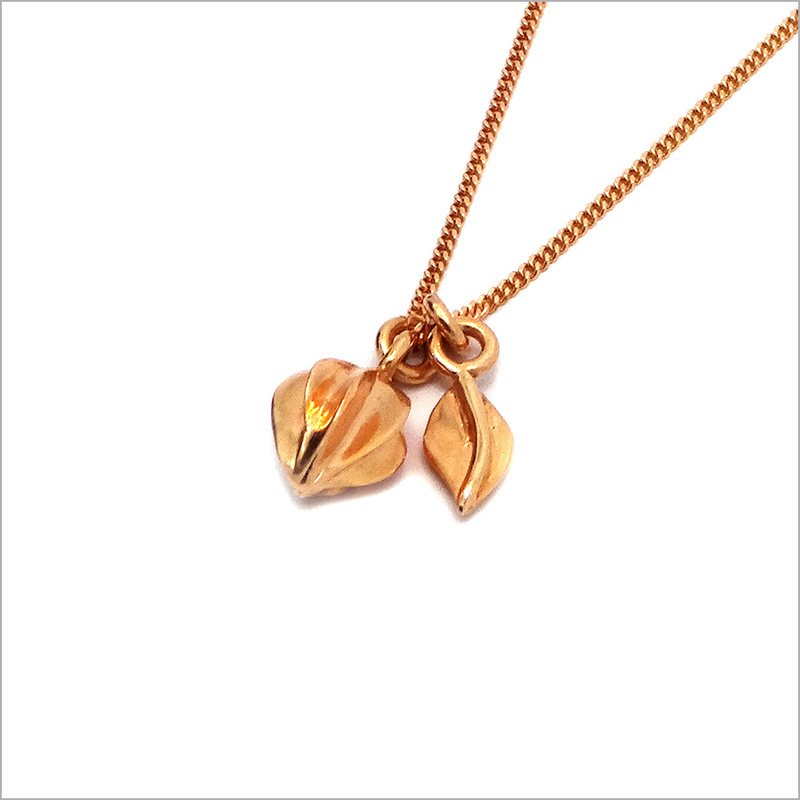 Small pendant with leaf inspired by the clean and elegant form of the Hozuki or Japanese lantern plant pods. 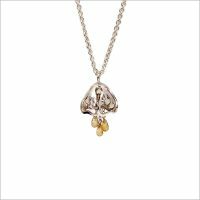 The hozuki pods enfolds a small and delicate fruit buried in its husk and so is considered by some to be a symbol for protection. Beautiful, handmade pendant inspired by the pods from a Hozuki or Japanese lantern plant. 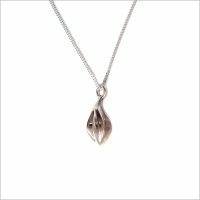 The pendant consists of a seed pod charm and a leaf charm. 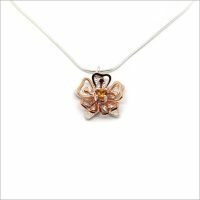 Size: The pod and leaf measure approx. 8mm excluding fixings. 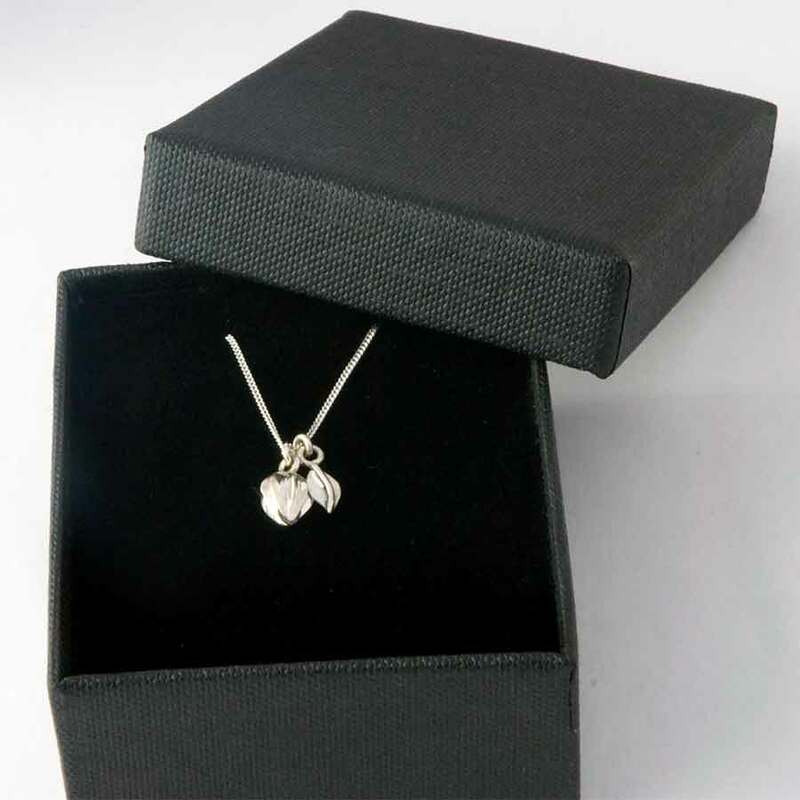 Pendant is hallmarked with traditional hallmarks and my very own makers mark registered with the London Assay Office. 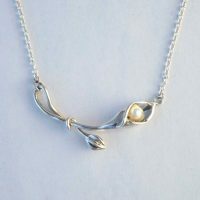 Sterling silver and white freshwater pearl inline pendant inspired by the simple beauty of Calla lilies. 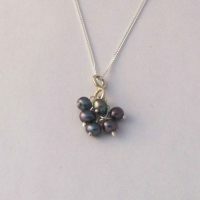 Sterling silver and peacock coloured freshwater pearl pendant inspired by snowdrops. 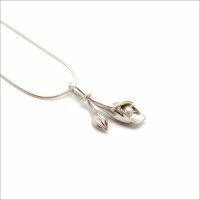 Sterling silver and white freshwater pearl pendant inspired by the simple beauty of Calla lilies. 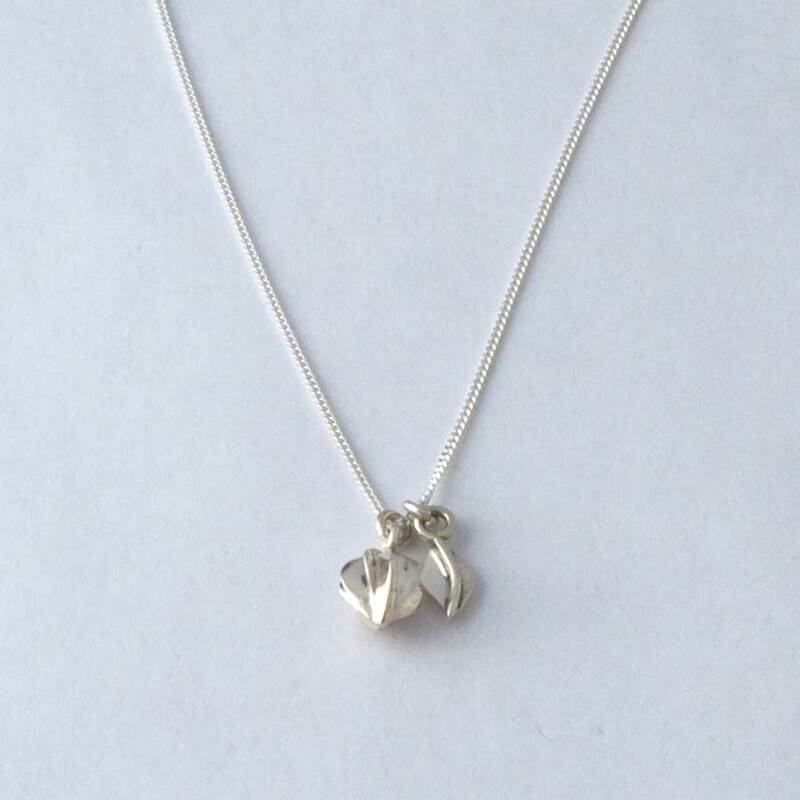 Sterling silver pendant inspired by the beauty and simplicity of the ginkgo leaf (“Ichōu”). Ginkgo trees are one of the oldest species of trees on earth have a great ability to withstand environmental stresses. 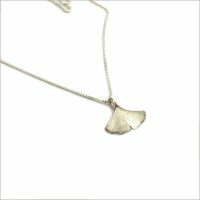 Following the survival of several ginkgo trees after the Hiroshima bombing, they have become a strong symbol in Japan, representing longevity, resilience, peace and hope. 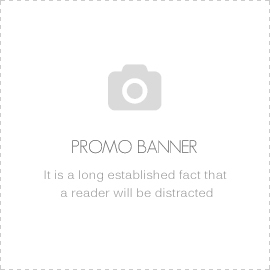 Ginkgo is also well known for its health benefits and is considered to help brain function and improve memory. 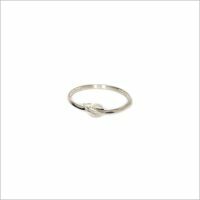 Delicate ring with a leaf which is inspired by the clean and elegant form of the Hozuki or Japanese lantern plant pods. 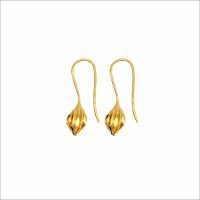 The hozuki pods enfolds a small and delicate fruit buried in its husk and so is considered by some to be a symbol for protection. 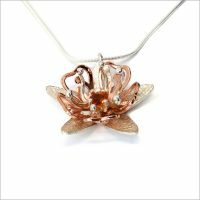 Large pendant inspired by the clean and elegant form of the hozuki or Japanese lantern plant flowers. 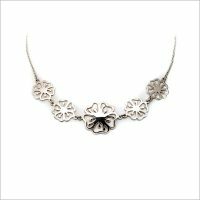 The hozuki flower enfolds a small and delicate fruit buried in its husk and so is considered by some to be a symbol for protection. 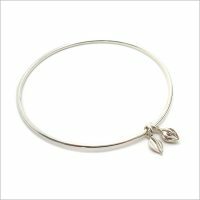 Bangle inspired by the clean and elegant form of the Hozuki or Japanese lantern plant flowers. 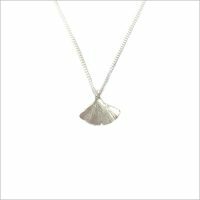 The Hozuki pod enfolds a small and delicate fruit buried in its husk and so is considered by some to be a symbol for protection. 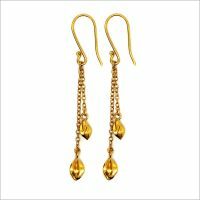 Available in sterling silver, 9ct yellow gold plated and 9ct rose gold plated finishes. 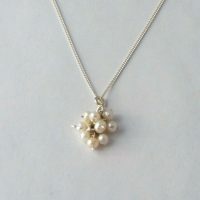 Sterling silver and white freshwater pearl pendant inspired by snowdrops.